Editor: Did you notice – those of you who still get the Union-Tribune – its anti-Russian bias this morning in the headline “Russian military strikes Georgia”(8/09/08)? Georgia actually began this current round of fighting with its own invasion of South Ossettia. The front page article in the U-T did not even mention that fact on the front page. Watch out for that holdover attitude from the Cold War in all US media when reporting on this conflict. 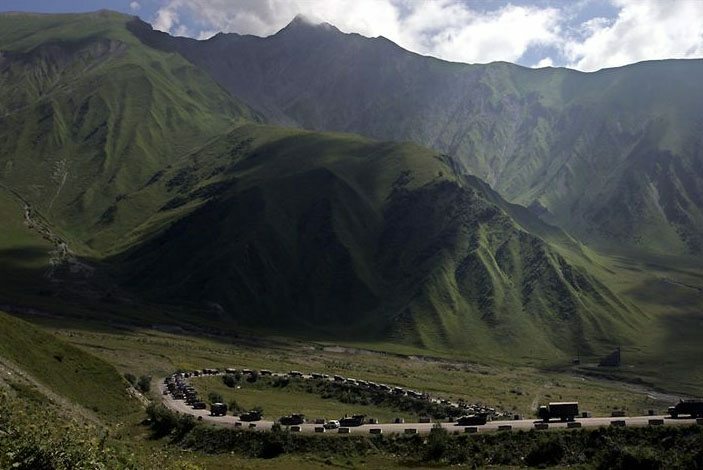 The war over South Ossetia, the breakaway region of Georgia, appeared to be widening last night. Vladimir Putin, the Russian prime minister, flew into the area from the Beijing Olympics as his forces seemed to be gaining the upper hand. After another day of fighting in the rebellious province – and Russian air force attacks that killed civilians in Georgia itself – there were reports of fighting in Abkhazia, Georgia’s other separatist region. Abkhazian leaders said they had launched air and artillery strikes on government forces with Russian air support. In South Ossetia itself, separatist leaders claimed 1,500 had been killed, including many civilians, in the initial Georgian assault on Friday. They said tens of thousands had been displaced. Moscow claimed to have pushed Georgian troops from Tskhinvali, the region’s heavily damaged capital. Russia admitted that two of its aircraft had been shot down; Georgia claimed 10. There were bodies in the streets of Gori, the Georgian town 25 miles from South Ossetia where Josef Stalin was born, after an attack by Russian warplanes. Putin flew directly from Beijing to North Ossetia, on the Russian side of the border. There he made it plain that Moscow’s armed confrontation with Georgia is not simply about South Ossetia but also about its switch of allegiance to America. “Georgia’s aspiration to join Nato . . . is driven by its attempt to drag other nations and peoples into its bloody adventures,” Putin said during a meeting in Vladikavkaz, the North Ossetian capital. Mikhail Saakashvili, Georgia’s pro-American president, accused Russia of launching a full-scale invasion. In Gori, Russian air force jets bombed military installations but also hit civilian buildings. Western journalists saw apartment blocks in ruins, some still on fire. One reported scores of bodies and bloodied civilians. Elderly people, women and children were among the victims. “I can’t understand their logic. Why are they bombing civilians?” said Nick Kipshidze, a local doctor. A Red Cross official told Reuters news agency that he had counted 17 bodies at a local morgue. President George Bush urged Russia to stop bombing, and last night Britain joined a diplomatic mission of European Union, US and Nato staff that was travelling to Georgia to try to broker a ceasefire. Officials, however, said options were limited. The UN Security Council has proven its failure. Watching live and was struck by the fact that all accused Russia. In doing so, the eyes of most representatives, have been omitted down! Why? They are ashamed of that? Nobody except Panama, did not mention casualties and carnage of the population Ossetia. Nobody said total destruction of Tskhinvali, together with civilians. Most likely valid information warfare launched against Russia. They do not want to hear the truth? Europe and America has not yet departed from stereotypes. Serbia is torn American administration (poor defenceless country). It is a pity that Russia was virtually alone in its position. Why then the Security Council did not say that respects the territorial integrity of Serbia? We are again trying to cover with spittle, only now does not work. Read comments from readers of newspapers and DIE WELT NEW YORK TIMES. Most readers do not support the regime of Saakashvili and called his Georgian Fuhrer. This is fascism and killing civilians. Saakashvili should judge a European tribunal for the genocide of the Ossetian people. Information warfare default spread to virtually all editions of foreign media. Information warfare – this is obviously a distortion of truth. If the distinguished foreign newspaper prints a fact, most ordinary person would believe. Personally, I have nothing against the Georgian people, I believe his brothers. But I am against the leadership of Georgia. I’m against fascism. This situation and recent developments (UN Security Council meeting), gets nasty angle, the UN Security Council was deadlocked. Americans and all people think recommend watch the film ZEITGEIST (looking at the search engines). I am sure most will know a lot of new! For peace of the world! Down with fascism! Older Article: There May be a Left, But is it Moving?